WHAT IS HYDRO JETTING IN JACKSON, WY? Hydro jetting was originally used to pressure wash the inner walls of a drain pipe to remove grease or build up and was typically used for restaurants that have very greasy drain lines. Times have changed; we now have special nozzles that can cut tree roots in a sewer line like a water laser. Hydro jetting is the only proven method that will flush your sewer or drain 100%. 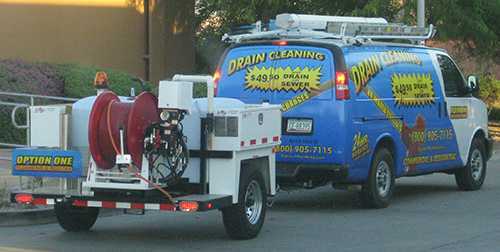 Option One Plumbing & Rooter is now offering commercial hydro-jet drain cleaning in Jackson Wyoming to our residential customers. Our process utilizes high-pressure water to effectively cut tree roots and emulsify grease. Sewer jetting is the application of streams of high-pressure water for use within pipes for cleaning and removing debris. As part of the jetting process, the water from the nozzle can also wash away accumulated dirt or debris on the bottom of the pipe, leaving you with a clean sewer or drain. WHO NEEDS A HYDRO JETTING SERVICE IN JACKSON? The hydro jetter maintenance process should be a regular consideration. For example, a restaurant that uses grease products, a sewer that backs up on a regular basis with tree roots or those drains around a pool that has dirt sitting in the bottom all year long. Hydro jetting will wash the drain pipe clean. We offer a full range of plumbing services. Whether it is a small job or a large job, our technicians are fully trained and available, 24 hours a day. We offer free estimates on all replacements or installations. Our experienced plumbers can also address any other plumbing problems in Jackson you might have. Such as: water leaks, gas leaks, garbage disposal service, drain and sewer issues, faucet repairs and installation, and Jackson low water pressure issues.